Ben Jones, 88, of Carlsbad, New Mexico, passed away August 27, 2018 at Carlsbad Medical Center. Visitation will be 5:00 PM – 7:00 PM, Thursday, August 30, 2018 at Denton-Wood Funeral Home. Funeral services are scheduled for 10:00 AM, Friday, August 31, 2018 at First United Methodist Church with Pastor Dan Boyd officiating. Interment will follow in Carlsbad Cemetery, Carlsbad, New Mexico. Denton-Wood Funeral Home is in charge of the arrangements. Ben Jones was born December 24, 1929 in Humboldt, Kansas to Benjamin and Violet (Singer) Jones. He graduated from Humboldt High School. Ben served his country in the U.S. Coast Guard. He married Lucille Pugh September 21, 1952. Ben graduated from Pittsburgh State University with Bachelor’s and Master’s degrees. In 1958 and they moved to Carlsbad, where Ben went to work for Carlsbad Public Schools. He taught industrial arts and later worked as an administrator before retiring in 1984. 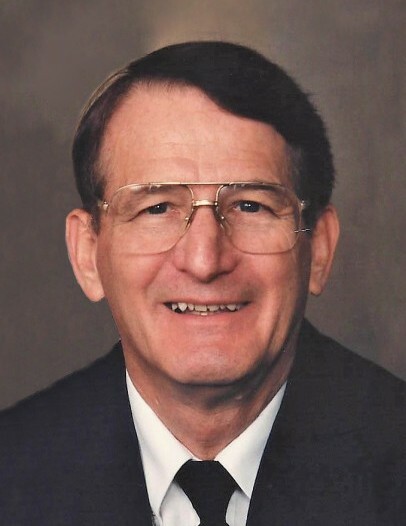 Ben served as the first president of the Carlsbad Chapter of the Full Gospel Business Men’s Fellowship International and was a member of the Emmaus community. He joined the First United Methodist Church in 1958 where he had been active in numerous areas including the Praise Team and Sunday School teacher. He also served on many of the church’s committees over the years. Ben had a passion for woodworking, restoring antique cars, and spending time at his Kansas farm. He was involved with Boy Scouts and led a troop to Philmont. Ben was preceded in death by his parents; brother, Lawrence Jones and sisters: Jeannie Ross and Martha Foster. Survivors are his wife, Lucille Jones of Carlsbad, NM; sons: Steve Jones and wife, Brenda of Carlsbad, NM, Stewart Jones and wife, Julie of Carlsbad, NM; daughter, Stephanie Overstreet and husband, John of Carlsbad, NM; grandchildren: Christopher Jones and wife, Crystal, Ashley Bock and husband, Cory, Kaitlyn Allen and husband, Daniel, Seth Jones and fiancé, Colby Kruger, Sara McCormick and husband, Josh, Alyssa Dralle and husband, Ryan, Amy Overstreet, Adam Overstreet and Aaron Overstreet; great-grandchildren: Hunter, Abby, and Annie Bock, Grayson and Garrett Jones and Barrett Allen and sister, Bettie Cramer of Columbus, Ohio. Pallbearers will be Christopher Jones, Seth Jones, Cory Bock, Daniel Allen, Ryan Dralle, Adam Overstreet, Aaron Overstreet, and Josh McCormick. Honorary Pall bearers are: Hunter Bock, Grayson and Garrett Jones, Mike Crawley, Carl Vinka, and Joe Stell. Memorial contributions may be made to First United Methodist Church, Youth Fund, 207 N. Halagueno Street, Carlsbad, NM 88220, or to a charity of your choice.